"Respecting centuries of building traditions found by Rana Kumbha in the 15th century and successively evolved till the reign of Maharana Fateh Singhji in the 20th century"
The plan outlines a value based and process oriented approach. It aims to serve as a model in heritage management. An architectural landmark at the palace entrance, the chatri was restored with traditional methods and is an exemplary conservation of tangible and intangible heritage. 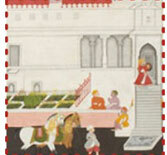 The exquisite 19th century glass inlay work in Mor Chowk within the City Palace is an icon for the city of Udaipur. This restoration work was taken up involving traditional artisans conversant with glass inlay work. Rawla Koshilav, a palace near Jodhpur in 1802 became a neglected piece of heritage in the 20th century. Around 65,000 pieces of the crumbling palace were transported to a scenic spot in Ranakpur, amidst the orchards and on the banks of a rain fed river, to create the Royal Retreat at FatehBagh. Besides being an architectural landmark, this island palace symbolises an era of peace in Mewar history. 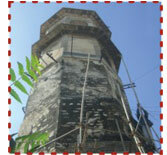 The restoration of Gol Mahal is being undertaken in 2009. Organisation: MMCF and LPHM Pvt. Ltd. The 500 years old historic structure of the catacombs was originally carved out on the edge of the hill as an integral part of the City Palace. The structure was excavated in 1996 and a conservation project to restore and adapt the catacombs as a Library was successfully executed. 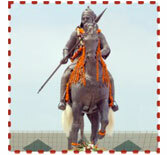 Contribution of an urban landmark for the city of Udaipur through installation of a gunmental statue of Maharana Pratap within the newly designed Maharana Pratap Airport Complex,Dabok,Udaipur.The gun mental statue weighing 3 ton was specially crafted in Haridwar and brought to Udaipur. 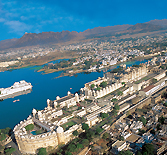 MMCF, Udaipur Municipal Corporation and UNESCO India signed a joint co-operation programme on the development of a sustainable agenda to preserve Udaipur under the Indian Heritage Cities Network by UNESCO India. This joint programme will help strengthen the competence of Udaipur, its administration, and inhabitants as well as protect and preserve its cultural and natural heritage. This exhibition project disseminates the primary interpretive theme of the City Palace using the research and documentation undertaken with the conservation plan of the City Palace. 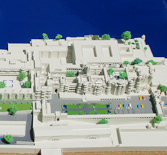 The exhibition has a gallery displaying architectural models of the four major phases of evolutionofthe palace complex. Museum Planning: A Museum Use Plan, Risk Management Plan, detail drawings with estimates for the entire palace complex are works undertaken with the Second Planning Grant received from the Getty Foundation, LA for 2008-09. Conservation Works in The City Palace: MMCF will also undertake Conservation works of Ghariyal ki Cahtri and Bhagwat Prakash Palace within the Complex in the year 2009. 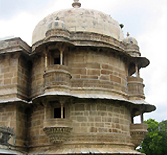 Conservation of Gol Mahal at Jagmandir Island Palace, Udaipur: MMCF and LPHM will be jointly undertaking restoration work of the Gol Mahal at Jagmandir Island Palace in the year 2008-2009. Conservation of the 14th century Surya temple at Ranakpur: Shree Eklingji Trust aims to source funds for the restoration of the famous 14th century sun temple at Ranakpur. 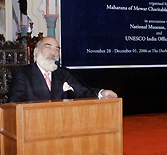 A Workshop on Risk Management and another one on Building Crafts of Mewar are scheduled for the year 2009 in partnership with UNESCO New Delhi, National Museum, New Delhi and the Heritage Institute of Rajasthan, Jaipur.